AFFORDABLE PRICES + GUARANTEED REPAIR, ANYWHERE IN NJ! 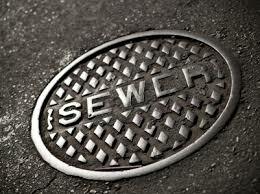 Sewer backups and sewer repairs in NJ are the most common sewer plumbing problems. From small repair to complete sewer replacement we are specialized sewer contractors for any sewer issues and repair in New Jersey. Sewer repairs often start with a sewer backup that keeps coming back after it was cleared. 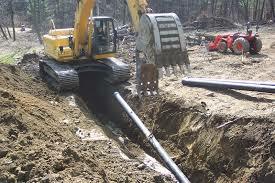 Broken sewer pipes repair: A broken or damaged sewer pipe will cause your sewer to back up repeatedly. Substance drain/sewer buildup: Over time, things like grease, oils and fats can build up in the sewer line and an ordinary drain snake will not be able to clean them out causing frequent backups. Tree Roots in the Sewer Line: Your sewer line is off course underground and very often tree roots can find their way into the sewer line through a small crack and grow and flourish in the moist sewer line, clogging up the line and potentially causing your small crack to grow bigger. For these types of sewer problems, a video camera inspection is usually the best way to discover the cause of the problem. Sewer video inspection is inexpensive and call tell you exactly what the cause of the problem is and whether water sewer pipe repair is needed. If you are having problems with your sewer line call us at 201-645-0888 for sewer video inspection to find out the cause of the sewer problem and get an estimate on sewer repair. In some cases, such as with substance buildup in the sewer line or tree roots that have not damaged the sewer pipe we can do sewer water jetting instead of sewer repair. 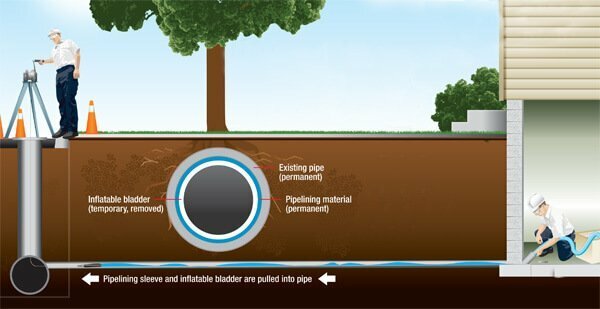 Sewer water jetting uses high pressure water to clean the inside of the sewer pipe and remove all substance buildup, debris and tree roots. 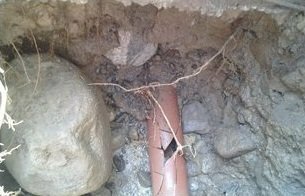 If the problem is a broken sewer pipe then excavation may be needed to dig up (excavation) the area of the broken pipe and replace it with a new pipe. 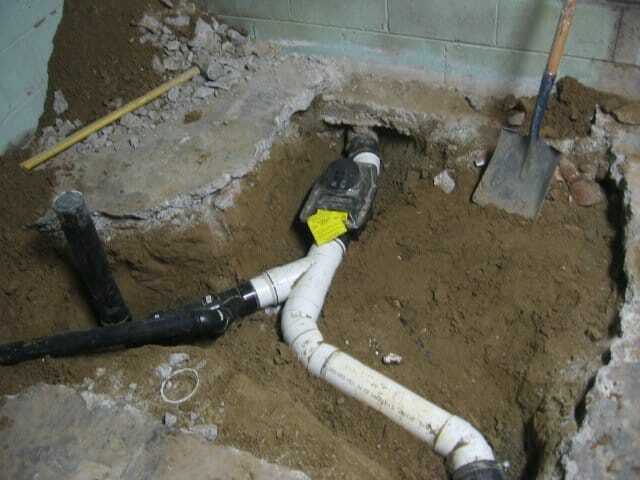 Sometimes we can avoid digging using trenchless sewer repair in which we would line the sewer pipe with a sleeve instead of sewer pipe replacement / repairing the broken pipe. 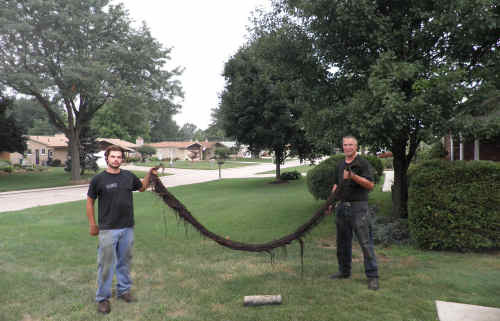 Roots in a sewer line grow by the moisture, invasive tree roots grow thicker with ongoing sewer/drain blockage problems. 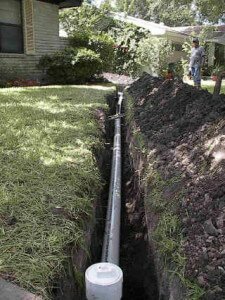 Root sewer line removal can be easy or difficult depending on how invasive the tree roots in the plumbing line are, whether the tree roots are wrecking and cracking the sewer line, and what it will take to control tree roots in the plumping pipes. Tree roots plugging the sewer line is very common in new jersey where we have many old and large trees that easily cause tree root intrusion into sewer lines. If you are having problems with your sewer line, give us a call at 201-645-0888 and we will send one of our professional plumbing technicians to root out the problem for you, kill tree roots in your sewer line and repair the sewer line.